Starting off with the performance at Ehime, then Aichi, Osaka and finally Tokyo, the outdoor festival was held at four cities over six performances. 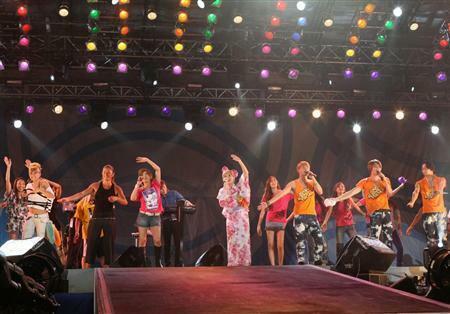 We’ll exclusively air performances held on the 28th and 28th of August at the Ajinomoto Stadium. Since its first round in 2002, “a-nation” has brought in over 200,000 fans each year, totaling over 2,500,000 people over these eight years. At this live event, with just one ticket, can bring you live performances from a grandeur variety of artists. Over the years, it has evolved to become one of Summer’s places to be. Talking about the charms of “a-nation”, it inarguably is the dream performance of a grandeur variety of artists. With different artists at each performance, the extravagant list of artists for 2010 has been announced. Also, “a-nation” has another charm point, it is the nation’s only outdoor festival with a circuit layout. With the passionate thoughts of “I want to express my thanks to listeners within Japan”, “Even if it’s only another one more person, I want them to feel the life and excitement of a live performance”, “a-nation” was born, and being held on a larger scale, now it runs as a circuit layout. Right now, as the best live with numerous artists, the best performances, and a chance to experience the best entertainment, it deepens the chances to meet with new artists and communicate with fellow fans. Really, you can say that there’s a sense of unity, only to belonging to “a-nation”. In 2010, “a-nation” was held in four cities, over six performances, starting on the 7th of August as Ehime, the 14th at Nagoya, two days, the 21st and 22nd at Osaka, and finally the final performances on the 28th and 29th of August at Tokyo. At the Ajinomoto Stadium performance, TRF, Every Little Thing, Hamasaki Ayumi, Do As Infinity, Koda Kumi, Otsuka Ai, Suzuki Ami, AAA, GIRL NEXT DOOR, ICONIQ and such artists were set to perform. Really, it’s no exaggeration to say that enjoying a performance with this grandeur of artists is not possible elsewhere. 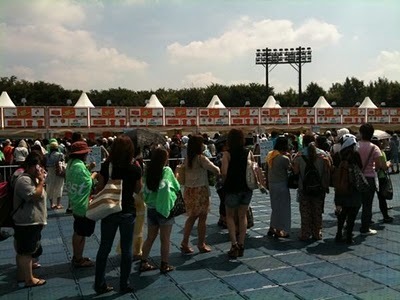 Watch the history’s best outdoor festival “a-nation”, 2010s Summer will never end! [Trans] 100830 Ayu, Koda, and Many Others Performing a Gorgeous “Symphony”! Live outdoor summer tour sponsored by Avex ‘a-nation’10′ (4 cities, 6 performances, 260,000 spectators) had its final performance on last 29th held at Ajinomoto Stadium in Chofu, Tokyo. 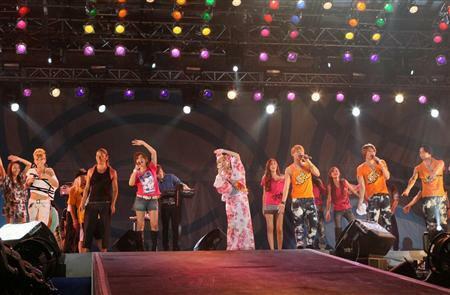 At the end of live, Ayumi Hamasaki (31), Koda Kumi (27), TRF, and other 33 artists from 16 groups gathered together on stage. The all stars then sang a-nation’10 official theme song composed by music producer Tetsuya Komuro (51) entitled “THX A LOT”. The live started from 2 pm to 9 pm, rocking the audiences with 7 hours live performance. ‘THX~’ was only performed in Tokyo on August 28th. The artists voice echoed at the night sky of Chofu that was decorated by fireworks, ended this major summer event with 54,000 spectators. Ringtone of the songs, will be included in solo album that is going to be released this fall. The past two day’s concerts have both been successfully carried out. To JYJ and everyone who has been to the performances, you have worked hard. “This year they won’t be participating right?” These types of thoughts have crossed my mind, but JYJ did confirm they were going. I’ve really waited for so long for the day that I am able to see them live. Inside and outside of the venue, there were many orange objects. If JYJ were to see this, they’d be very touched. Around 6:30, they finally came out. When they came out, Jaejoong looked like he did on the first day of their debut, and I’m not sure why but his eyes seemed to be slightly red. Yoochun seemed a bit skinnier. His hair seemed really natural, not straightened or dyed. How come his hair is so black? Because the two next to him had brown hair, his hair seemed a lot darker. Junsu is blonde, and seemed very lively, but very cute. When the performance began, he became completely serious and charismatic. Unfortunately, the angle for photography wasn’t very good, which is a pity. I think one of their sleeves was ripped? Oh please! Please prepare a better outfit! Come to think of it, every year their outfits are always of similar design..
Their expressions in the photographs were just too cute! I was wondering, “Will they sing ‘W’?” Turns out they did. Especially Jaejoong’s last bit, sweaty, breathy Jaejoong! It’s really been a while since we last saw them being this lively together, but even so, they’re still standing in front of us singing! I was deeply touched by these feelings. Also, yesterday was the SMTOWN concert as well, Homin must be working very hard too. On the same day, the five people who were performing on two different stages, still conentrating hard to put on a great performance. But the five of them are still as Yoochun said, getting along as smoothly as water. They are definitely like that. Like Yoochun said they are. Unless they immediately returned to Korea to finish filming the drama? The amount of screaming that went on when Junsu was dancing could’ve made at least 2 to 3 people faint. The soulmates which grasped each others’ hands when they passed one another. At the end, right before their harmony, I thought they were going to start singing, but then Jaejoong walked to the front of the stage, stood for a while and walked back. Of course, in the end, they still delivered the perfect harmony. The dancing was absolutely perfect, and the atmosphere was amazing! No matter how many times I’ve listened to this song, hearing it always makes my eyes fill up with tears. Jaejoong’s singing is just too good! Yoochun had a towel in his hand, I think he threw it towards the audience? They’ll be performing in Tokyo next week, I really want to go!! Those of you who will be at the Tokyo performance, give them your enthusiastic support!! ★Junsu’s Intoxication! Still very charismatic! At that time, suddenly saw the sleeves of his outfit coming off!! Is it torn? Or is it an outfit designed so it could be with sleeves or sleeveless? During the fourth song ‘Get Ready’, there was a new dance, feels like everyone there were together, this song really is happy! The fifth song ‘Long Way’! The lyrics were displayed on the screen, very touching, makes people want to cry. Getting to see the lively performance by them three, it was amazing!